Over the past six years, I’ve watched the Nick Jr channel decline rapidly. I think back to when my paroled mental patient was 2 and all the great shows that used to be on, no advertising, no bs. – 3 full minutes of ads. – Part 1 of Paw Patrol show actually begins. – Once part 1 has ended, there is now a solid FIVE minutes of advertising (I have timed it, since my fast forward button that jumps 30 seconds forward needs to be pressed 10 times). – Part 2 of Paw Patrol starts. – Part 2 Paw Patrol ends. – More ads until the end the next show/cycle starts. And it’s not like we’re talking innocent ads here. Covergirl makeup has absolutely NO place on a preschool channel. When my daughter asked me the other day if she could have that special hair straightener, I about lost my mind. So basically, if I want them to watch any of the newer shows, I have to be sitting there monitoring every minute of it and have my hand ready at the fast forward button. Back in the day . . . there were awesome things on Nick Jr such as Moose & Z, Little Bear, Oswald. Shows that were fun, and filled with kindness, mellow and yet happy at the same time. While a couple of their news shows are good, this advertising stuff is sending me off the edge. We do like Paw Patrol for the mechanics and Wallyzakam for the reading. Don’t even get me started on that piece of crap called Nick Mom at Night or whatever it’s called. Oh lord! Back to how awful Nick Jr is now. I recently discovered they launched an app called Noggin. The only appalling thing about this app is that it’s a subscription so it’s $5.99 a month. Initially outraged, I begrudgingly began the free trial because I wanted to see if we’d get any use out of it. Low and behold, there are all our old favorite shows on it – all of Oswald (the 3-year-old escaped mental patient’s favorite), Little Bear, Jack’s Big Music Show. I’ve not been feeling well and as it got worse over the weekend, I took myself off to the Minute Clinic in CVS to see a doctor. Brought the iPad and my phone (Noggin also installed there) since I had to lug the kids with me. During my almost 2hr wait, thanks to wifi everywhere, I was able to stream Noggin on both devices (still on one subscription). Here’s where the sun shone brightly. My 6-year old was scrolling through it and found Jack’s Big Music show. It’s always been my favorite of my kids’ shows, and I was so sad when it disappeared after two seasons. It’s been so long that she didn’t remember it at first. I reminded my girl how we used to watch it together, just me and her, and we’d sing and dance along to the music (great music, btw). That show also is the one that introduced us to Laurie Berkner to which my kids have spent many hours dancing the evening away to. I confess, I bounced around the waiting room with the kids to the music (I love Dr. Strings) and loved being able to listen to Jack’s Big Music Show again. You can’t even get it on DVD so this is wonderful. The kids made a fort out of the couch cushions last night and I heard the girl tucked away in there watching Jack again. It made me happy. I was lucky enough to do a 7-day cruise last week. It was the first real family vacation my husband and I have had with the kids and what better than to do it with a Nick Jr cruise. I admit our expectations were high going in. Hubby and I did a 4-day Carnival cruise on our own last summer. Carnival has the reputation for being the lowest of the budget cruises and not being good at all. We however had a fantastic time that weekend. No kids (this was a major factor) but we knew everything else was going to be average. Our first ever cruise was on Celebrity before we got married and boy, there’s where you are treated like a king and queen forever. So when it came to a Nick Jr cruise, I had high expectations. Not Celebrity high, but high enough that a major network would affiliate itself to it. Unfortunately, we had one or two hiccups (meaning LOTS) on board. 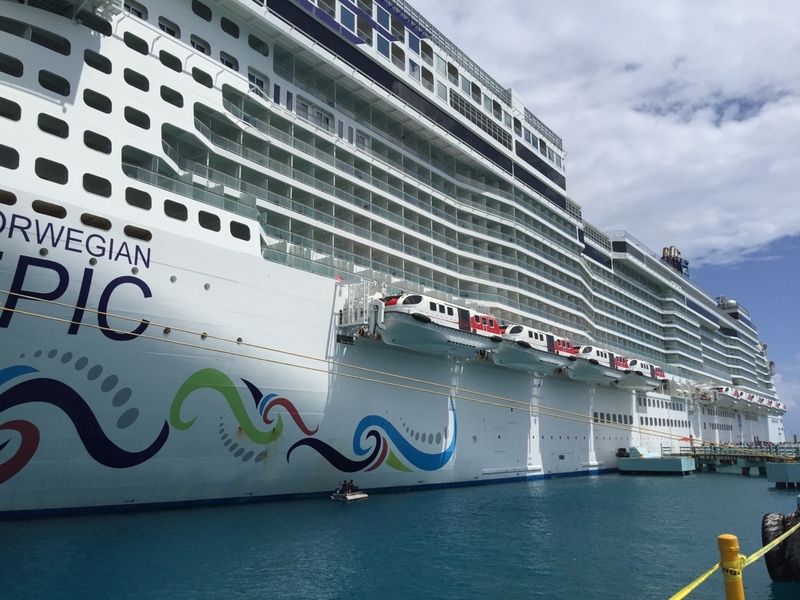 We embarked the Norwegian Epic Sunday afternoon and by Thursday, I couldn’t keep my mouth shut any longer and marched myself down to guest services. There weren’t huge things going wrong, just minor little things that kept adding up to a crappy cruise experience. Without writing a 5,000 word essay on the experience, I’ll simply give you the pros and cons. – Splash Academy where you can drop off your kids to get some free time. These people rocked. The kids loved it there (I was shocked). Every night had a new theme and toward the end of the cruise, I’d try to pick up the kids and they’d ask to stay longer. – There is a good variety of restaurants on board (see below though). – You’re cruising through the Caribbean with that gorgeous view around you. What’s not to love. – Norwegian try to be very eco-friendly, so your key-card turns on the lights. Therefore, when you leave your cabin, you can’t leave all the lights on. 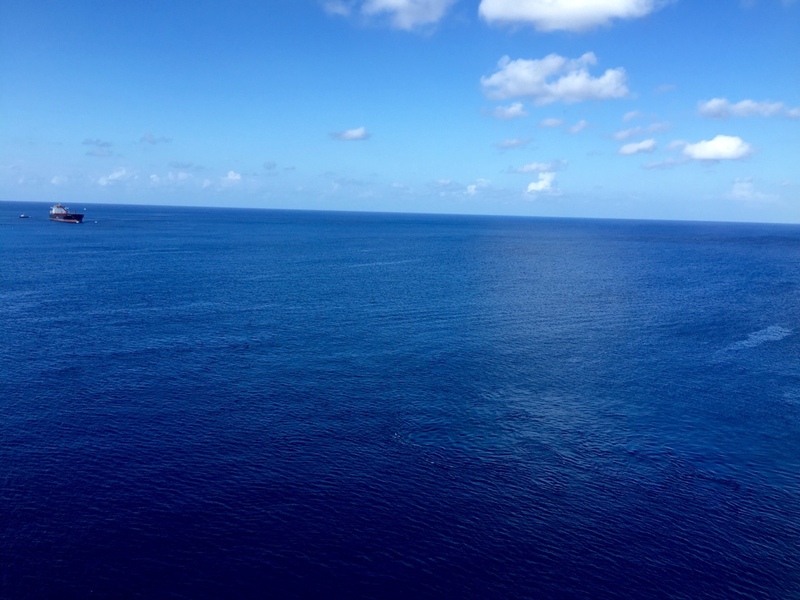 – Thursday, there were four cruise ships docked in the Grand Caymen Islands. So we elected to stay on board. Then we had a great time. No problem getting seats, quiet pool area, so much more relaxing. So that’s your tip, when you are in port, that’s the best time to be on the ship. – The Ultimate Beverage Package. It’s pricey but you’ll need the alcohol to get through the cruise!! And it is unlimited. You may order a tasty cocktail for yourself as many times as you want. The only restriction is that you order one at a time. Fair enough. – We boarded Sunday afternoon and weren’t even so much as handed a map of this enormous ship. So we had no idea where we were, what deck we’d even walked onto or where our cabin was. – The light switches in the cabin were less than intuitive (and really, how hard can this be). In trying to turn off the vanity lights Sunday night, my husband wondered if it was a touch light since there wasn’t a switch in sight. The bulb was so scalding hot that he badly burned his finger and had a huge blister on it the next day. So much for eco-friendliness. To show me how hot it was, he wet a face cloth and placed it over the bulb. The singe was very audible. – The layout of the ship was the most confusing thing ever. And obviously no thought went into the pool or splash pad because there were very large structures in between the kids pool and the toddler splash pad. That meant we couldn’t see either area at the same time without sitting in one of two very specific spots on the deck. To that end, while watching my 6-year-old, the 3-yr old wandered off and got lost. Yeah, that felt great. – We went back to our cabin Monday afternoon only to find our key card didn’t work. We called for someone to come help us and it took a full 30 minutes before someone arrived. The Engineer arrived very quickly, took apart the lock and discovered that someone had placed a dime into our key card slot. Well thanks very much. – We wandered to Spice H20 (adult only area during the day) to check out how to get some quiet time. Insanely, we were greeted with an amphitheater that had a huuuuuuuge screen on the very back of the ship. So in the adult area, you couldn’t even see the ocean thanks to that monstrosity and then you were bombarded with noise. With two days left on the cruise, we discovered a “quiet area” on deck 16 which would be great except it had nothing on it. No shade, no comforts, nothing. – The family pool area was fairly small and the cruise line insisted on blasting music from 10am-6:30pm. When I say ‘blasting’, I mean a 747 would’ve made less noise. By the time Tuesday morning came around, none of us (including the kids) could stand it anymore. – Monday night in The Manhattan Restaurant, I had French onion soup which was the worst thing I’ve ever tasted. Followed by the most bland linguine with clams. If I say it’s bland, then imagine this – black pepper is too spicy for me. If I consider something bland, it has to be completely tasteless. Our waiter said we should talk to some dude who took notes of our issues and that was it. – Tuesday night, we wanted to try something different for food. We discovered that most of the restaurants there actually had a cover charge (ranging from $15-$30 per person), except maybe 4 of them. Oh, two of those four without a cover charge serve exactly the same menu every night. So while there is a good variety of restaurants on board, to experience them you have to pay an additional cover charge and/or pay a la carte. WTF! In our quest for a different experience, we went to Taste which is where we found out that it had exactly the same menu as Manhattan. Just a little more laid back atmosphere. Unfortunately, it was so laid back that the waiter took our kids’ orders and we never saw him again. The food for the children was delivered and our order had yet to be taken. Then it was like hunting for Big Foot to try to get out orders in and get the hell out of the restaurant. – It was in Taste that night that my poor mother-in-law began questioning why there seemed to be a lack of vegetables in all the meals. In a quest for healthier food, she ordered a “Garden Spring Lettuce Mix” and underneath it was written “Crunchy Garden Vegetables | Chives.” Her plate arrive and she searched in vain for some vegetables. She asked the waiter where were the vegetables and he looked at her as if she was nuts, because the three slices of onion on top of the lettuce was supposed to pass for “crunchy vegetables.” No chives by the way either. – We had brought two glasses of water and a mimosa to our room Sunday night. Tuesday night, the empty, used glasses were still left there. 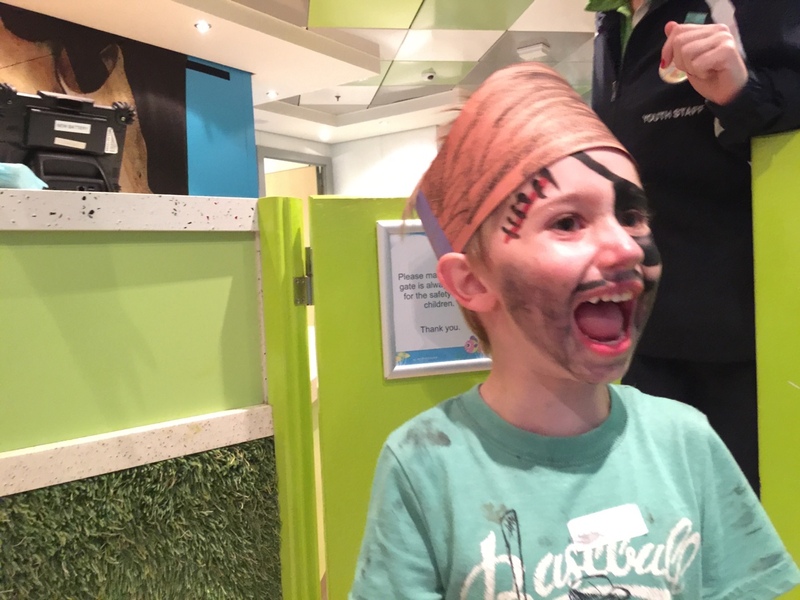 – When at any of the restaurants, the kids are handed a kids’ menu. Superb. On the back of the kids’ menu is a coloring page. Excellent. However, none of the restaurants carried crayons. Seriously. For real. They didn’t carry crayons or even a pencil (my husband had been searching for one since he’d set foot on the boat). Why the flying f*&k do they give kids a coloring page without anything to color with????????? – There isn’t any hair conditioner in the cabin. This sounds silly, it’s only shampoo. When both females in the cabin have long hair, and one of them is a child, the results are painful. When I complained about this, the manager tried to tell me it was a shampoo/conditioner combo. But it’s not. It’s labelled “Shampoo” and even my husband with short hair could tell me there was zero conditioner in there. – My three-year old’s aim for the toilet isn’t the best. By the end of the week, our cabin bathroom reeked which told me that the staff don’t clean that area at all. – I’m not sure if I’ve just got high expectations or what, but when the cabin staff were making the beds, they would simply throw all the pajamas into a pile on the stool in front of the vanity desk. – Thursday, when everyone else was off the ship, we got those “special” seats from where we could watch the pool and toddler splash pad. But the pool was close for “maintenance.” Despite being assured that it would be open at 10am, at 11.45am, I was ready to explode. That’s when I just couldn’t take it anymore and marched down to guest services. – Thursday night, we were approached by the Maitre’D of the Manhattan who offered his apologies for the service and would like to invite us to La Cucina ($15 cover per person) the next night as his guests. Fair enough. The food was marginally better but not crazily better. So if I had actually paid $15 per person to get in there, I would’ve been crazy pissed. – We went to bed Friday night, got the kids to sleep only to hear a thump-thump-thump throughout our entire cabin. Some architectural genius put the family cabins directly below the pool which meant that the Friday night pool party shook our cabin for two hours. – Saturday was a day at sea and again, there wasn’t a seat to be found by the pool. My husband stalked chairs for an hour and a half before two became available. Mind you, over half the chairs were unoccupied by people. They simply had towels laid over them, in reserve. The chairs that we wanted (so we could see both children at the same time) was unoccupied for four solid hours. There was a towel and a bag there. Eventually, a woman came over, grabbed some sun lotion from her bag and then went to another lounge chair in the sun. Are you kidding me?? I asked the waiter what the time limit is for this crap and he responded that people could only leave towels there for an hour. But no where is this posted on the ship. When I informed the waiter of what was going on next to me, he told me I needed to speak to someone else. WTF. Meanwhile, a little bit away from me, I saw a woman struggling to get her young daughter into the shade because the daughter needed a nap and I just couldn’t keep my mouth shut. I told them the chair next to me was not only vacant for the past four hours, but the intended occupant was over there sunning herself somewhere else. At least on Carnival, there was a 45-minute rule (at least in the adult area) and everyone was within their rights to remove a towel from an unused chair after that. On Norwegian? Pheft.